A plan to transport convicts from San Quentin Prison to a newly-built facility in Valley Center would likely be greeted by strong protests and demonstrations if it were to be proposed today. But such a prison actually existed here seven decades ago. In 1940, state corrections officials began construction of a minimum-security complex called the Moosa Canyon Prison Labor Camp #38. The following year, some 70 convicted felons were moved from the main San Quentin complex in northern California to Valley Center. The amazing, but little-known story of the local lock-up, also involves the nation’s national defense and construction of a major highway during World War II. Prisoners were assigned to a work detail building a new road that would link San Diego naval yards to March Air Field to the north. It was wartime, the coastal road was closed at sundown, and a dependable inland road was needed to transport men and machines. On April 17, 1948, the local San Quentin convicts completed a realigned and modern roadway known today as Old Highway 395, which is the official western boundary of Valley Center. 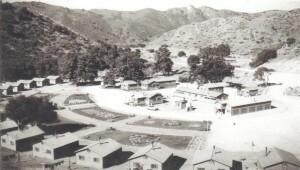 After the final segment of roadway was laid in 1948, the prison camp buildings were moved to another camp site. The property, on a street with the present-day name of Nelson Way, sat vacant until the early 1960’s when an RV campground was established. It is known today as the Champagne Lakes RV Resort, and sits midway between West Lilac and Old Castle roads. Notes: Data and information on the local prison labor camp are in the archives of the Valley Center Historical Society at the History Museum. Photos in the collection were taken in the 1940’s by the late Laurin Portis of Escondido, a civilian employee of Caltrans who worked as a rock mason alongside the prisoners. His family made them available to the Historical Society.